An adventurous journey through the heart of Southern Africa, starting in Cape Town, South Africa travelling to the 'Smoke that Thunders', Victoria Falls in Zimbabwe, via three magnificent countries in search of the Big Five and remote wilderness. Hwange National Park - One of Zimbabwe's premier national parks. One of the most vibrant and beautifully located cities on the planet, Cape Town, set before the iconic backdrop of Table Mountain, has grown to embody the true feelings of energy and hope that South Africans feel for the future of their country. Founded by the Dutch East India Company in 1652 as a refuelling point along the trading routes between Europe and the spice rich lands to the east, Cape Town grew over the next century to become a thriving town. Over the intervening years it has absorbed the cultural influences of the Dutch, French and British settlers, as well as the freed Muslim slaves, and all have left their mark on this city in one form or another. Today it is a rich fusion of spectacular natural assets, modern high-tech city centre and a mixed population that lives relatively peaceably together, whilst still retaining the unique diversity of their own customs and traditions. During your free time this afternoon there may be an opportunity to ascend Table Mountain by the Aerial Cableway (optional), please note the cableway closes for 2 weeks for maintenance each year roughly from the end of July. This is our first encounter with some of the unique and colourful flowers from the Cape Floral Kingdom - which has more indigenous plant species per square metre than anywhere else on earth. Views from the top are simply stunning and a network of trails crisscross the plateau, providing a variety of vantage points. We spend the whole day enjoying a comprehensive sightseeing tour of some of the many highlights that the Cape Peninsula has to offer. One of the highlights of today's tour is a visit to the Cape of Good Hope, first seen by a European in 1488 when Diaz sailed round it on his search for a sea route to the East Indies. A century later Sir Francis Drake described it as 'the fairest cape we saw in the whole circumference of the earth'. But it was another century before the Dutch East Indies Trading Company established a permanent settlement to supply ships with the cattle and water traded from the indigenous Khoi herders. We will also visit the African Penguin colony at Boulders Beach, just on the outskirts of Simon's Town. This is one of only two mainland colonies anywhere in the world for these amazing, and sadly endangered creatures, commonly known as Jackass Penguins because of their donkey-like braying. We will then return to Cape Town via Hout Bay, an attractive fishing port once flanked by dense forest and in sight of nearby Seal Island, home to some 1000 Cape fur seals and guarded by the impressive 'Sentinel', a towering mountain that dominates the harbour. If not done already there may be another opportunity this morning to enjoy an early ascent of Table Mountain by cable car, before we leave Cape Town behind and head for our camp lying in the shadow of the imposing Cederberg Mountains. Note: Departures in September and October (Spring) may well coincide with the blossoming of wild flowers, though this cannot be guaranteed as it is quite unpredictable. Continuing north through Namaqualand this morning we pass through the small mining settlements of Okiep and Springbok en route to the Namibian border. Seemingly barren and desolate though this landscape might appear, the traditional heartland of the Nama people is actually home to the greatest diversity of succulent flora on the planet. The day sees us traversing this unique desert landscape of granite rocks and sweeping dunes as we head for the Gariep River (Orange River), which forms Namibia's southern boundary with South Africa. Beginning in the highlands of the Drakensberg Mountains, the river flows for some 1800km, finally ending its epic journey amongst the waters of the Atlantic and this evening we will stay close to its meandering course, as we enter our second country in this remarkable odyssey. Tonight our crew will provide a barbecue dinner. After breaking camp this morning we head for the world-renowned Fish River Canyon, one of the great natural wonders of Africa and the second largest canyon in the world after the Grand Canyon. Measuring some 161km in length, up to 27km in width in some places and over 500m in depth it is one of the world's most grandest natural creations. On arrival we will have some time to explore the canyon, with a walk this afternoon around the upper rim that will afford us an opportunity to appreciate this stunning landscape. San legend has it that the canyon was carved by a great serpent, Kouteign Kooru, however less romantic theories put its creation down to the action of erosion and glaciers. The plains are sometimes dotted with steenbok and springbok, whilst the rocky slopes above tend to be a favoured haunt of Chacma baboons and klipspringer. The richer vegetation close to the river also attracts a number of birds, including raptors such as rock kestrels and lanner falcons. Today's journey brings us into the magnificent setting of the Namib Desert and the Namib-Nakluft National Park. As we head north, crossing the Namib gravel flats and the awe-inspiring landscapes of some of the oldest desert on the planet, we have our first opportunity to watch the sun cast its shadows over the red dunes of some of the most spectacular vistas on earth. Covering some 50,000 sq km this is one of the largest national parks on the continent, encompassing an area of truly magnificent desert scenery that is credited with being home to some of the strangest flora and fauna on the planet. We spend the day exploring this majestic landscape in all its glory, firstly with a morning visit to the towering dunes of Sossusvlei, some of the highest on earth. The area itself is a vast depression or clay pan, dominated by sand dunes that can reach up to 300m in height. In the early morning the first rays of the rising sun turn these towering sand giants a deep orange, presenting us with a landscape of overwhelming grandeur that is truly a photographer's dream. It is a wild, beautiful and romantic spot, with sparse vegetation edging the few watercourses that flow in from the Tsauchab River. Here springbok and ostrich are often seen and the occasional acacia tree stands out in stark contrast against the golden sands. Lying amidst this harsh and barren world we come across the surreal landscapes of the Dead Vlei, an ancient salt pan of dazzling white, filled with the skeletons of long dead acacia trees, their gnarled and twisted carcasses presenting an incredible spectacle against the softer tones of the surrounding desert. This afternoon our tour takes in the cooler confines of the Sesriem Canyon, which we will explore on foot. Small, but very picturesque, the canyon presents a marked contrast from this morning, with numerous plants growing in the shade and shelter offered by the canyon walls and water pools attracting several species of birds and animals. Sesriem translates as 'six thongs\ , referring to the six lengths of rawhide rope (from a wagon) needed to haul a bucket of water up to the canyon rim from the stream below. It may also be possible later to climb the Elim Dune for sunset this evening, presenting the stunning spectacle of the Naukluft Mountains in the distance. Travelling via Solitaire and through the spectacular Kuiseb Canyon, we then pass more fascinating landscapes as we head to Walvis Bay. Here a large spit forms a natural deep-sea harbour, which attracted the first navigators in the late 1400's. Today the shallows located where the spit joins the mainland are home to a diverse collection of birds, the most spectacular being the flamingos and pelicans that feed here seasonally (May to November usually). From here it is just a short drive to our final destination for the day, the coastal town of Swakopmund. Initially founded by German settlers at the end of the 19th century, Swakopmund was intended to serve as the main harbour for German Southwest Africa. Over the next few years it saw a steady increase in maritime traffic, eventually handling all the export and import traffic for the entire territory and this importance is reflected in the array of German architecture that still makes up a large percentage of the old town. Swakopmund is a fascinating mix of Bavarian grandeur, Herero traditional and African colour, all set between the pounding waters of the Atlantic and the vast expanses of one of the largest areas of unspoilt wilderness on the planet. Today has been left free to enjoy this eclectic hotchpotch of cultural mores. You may like to pay a visit to the town's excellent museum, or take a wander through the stately grandeur of its colonial architecture. The town is also a popular resort area and there are a number of optional activities available to make the most of its natural delight. There may be an opportunity to take a half day cruise in Walvis Bay in search of dolphins and seals, or perhaps enjoy a scenic flight over the desert and coast. This evening you may like to round off the day watching the sunset across the coastal dunes. Today we head along the coast, where we visit the Cape Cross Seal Colony. It is here that between 80,000 and 100,000 Cape fur seals bask in the sun or swim playfully in the cold waters of the Atlantic Ocean. The seals are quite big, an average male weighing-in at anything up to 187kg (501lbs). The females give birth to a single pup around late November to early December and are considered pregnant for most of the year. Driving into Southern Damaraland we'll pass the majestic sight of Brandberg Mountain (2,573m). The Brandberg is Namibia's highest peak, located in the Damaraland region of the northwestern extremes of the Namib Desert, and its imposing presence on the gravel plains makes it an easy landmark to spot from miles away. The Herero call this majestic peak Omukuruvaro (The Mountain of the Gods) and within its craggy granite folds lie the famous White Lady rock paintings. To the ancient San Bushmen this site was sacred and this ancient image has been attributed to these indigenous peoples, although its interpretation has been open to debate for decades since its discovery in 1917 by a German explorer. Harsh as these landscapes are they are also rich in life, and although numbers are small most of Namibia's desert dwelling wildlife live in the area, including desert elephant and the rare black rhino. To reach the rock paintings we will walk via mostly flat terrain between rock formations and it will take us approximately 1 hour to reach. Do remember to wear comfortable walking footwear and have a hat, suntan lotion and plenty of water with you today. Our final destination for today is the lowlands of Damaraland's Brandberg Mountain, close to the famous area of rock engravings at Twyfelfontein. This morning we drive towards Khorixas and pay a visit to the San Bushmen paintings and engravings at Twyfelfontein and view the so-called Petrified Forest. The massif of Twyfelfontein contains a spectacular record of the rock art of the Khoisan people, painted and incised into the sandstone of the mountain over a thousand years, presenting us with one of the richest areas of rock engravings in Namibia. The barren surroundings and rock-strewn slopes seem a most unlikely place for any human habitation, but there is a small spring near the base of the hill and this has been providing water to animals for millennia. The water and abundance of game also attracted Stone Age people and indications are that they inhabited the area for centuries. The extraordinary Petrified Forest, with its huge fossilised tree trunks, was declared a National Monument in 1950. It is estimated to be about 200 million years old, and both the bark and the tree rings are perfectly preserved, providing a unique insight into a bygone age millions of years ago. This morning we continue our journey into Etosha National Park, the 'Great White Place', ranked as one of Africa's great game parks and offering some of the best game viewing on the continent. An immense, saline desert, covering over 12,400 square miles, and offering a haven for 114 species of animals and some 340 species of birds, Etosha has been described as the best game reserve in Africa. At the very heart of Etosha is the Etosha Pan, which geologists believe was formed some 12 million years ago from an inland lake about the size of Holland. Shrunk to its present dried-up size, it is now a gigantic depression in the ground - flat, saline and silvery, a mysterious place of mirages and dust-laden images, that after heavy rainfall converts back to a lake again. Today sees us exploring the area along the southern and eastern edge of the Pan, where we should see elephant, rhino and hopefully lion. The terrain ranges from dense bush to large open plains where animals roam freely and we will drive along a network of gravel roads that criss-cross the park, visiting the various viewpoints and the permanent waterholes around which animals congregate. There is something enigmatic about the vast silent grey-white pans that cover this remarkable reserve. Numerous waterholes and underground springs attract large herds of animals including springbok, zebra, wildebeest and giraffe, making for some exceptional encounters. July to October are generally the best months for game viewing, during Etosha's dry season. Today we continue our game drives in Etosha, travelling across the park and taking in more of the abundant wildlife. Today we drive towards Rundu and our accommodation situated on the banks of the Okavango river where you can enjoy the natural serenity of the area. In the late afternoon there may be an opportunity for a walk along the river and a spot of birdwatching. Crossing into Botswana today we head along the western edge of the Delta (better known as the Pan Handle). The Okavango is the third largest river in Africa and its delta area covers 16,000 square kilometres of crystal clear channels, a myriad of ephemeral lakes and ever changing islands surviving at the northern limits of the Kalahari Desert. The river flows south east from the Angolan highlands over 1,000 km away, taking up to six months to reach the delta area which floods on an annual cycle. Our journey takes us through this fertile and captivating landscape. This afternoon we will have a short stop at Bwabwata National Park before continuing on into Botswana. may spot fish eagle, jacana, kingfisher, heron, stork, egret, weaver and bee-eater - just some of the magnificent species found here. Chobe National Park comprises a variety of habitats of flooded grassland, thicket and salt pan. The banks of the Chobe River, one of the Zambezi's main tributaries, is home to an abundance of wildlife. A major feature of Chobe is its elephant population and is considered to be the largest surviving continuous elephant population. It is currently estimated at 120 000 strong. This population covers most of northern Botswana plus northwestern Zimbabwe and has been built up steadily from a few thousand since the early 1900s when massive poaching at the height of the illegal ivory trade decimated other populations in the 1970s and 1980s. The Chobe elephants in this area have the distinction of being the largest in body size of all living elephants, but the ivory is brittle and there are no more of the huge tuskers from a bygone era. This morning we take a game drive in the park and this afternoon we enjoy a boat safari on the Chobe River. The river is brimming with hippo and crocodile and its waters teem with bream, barbel and tiger fish (freshwater barracuda), making it an angler's paradise. This area is also famed for its beautiful scenery and magnificent red and gold sunsets and offers a wonderful experience at the end of the day. Tonight is a barbecue dinner prepared by our crew. This morning we drive across the border into Zimbabwe to one of the country's largest game reserves, the Hwange National Park on the edge of the Kalahari Desert. This afternoon we will pay a visit to the Painted Dog Conservation Centre, a vital refuge that is working to protect the endangered African wild dogs from the devastating consequences of illegal poaching. At one time these phenomenally successful predators ranged across the entire continent and numbered in the hundreds of thousands. Sadly today those numbers are estimated to be as low as 3000-5000, placing them on the verge of extinction. Today we have a full day's game drive in Hwange NP which covers some 14,600 square kilometres and is home to over 100 species of mammals. The park is blessed with a rich assortment of game that includes large numbers of gemsbok, brown hyena and elephant, as well as one of the largest populations of African wild dogs on the continent. Encompassing a variety of landscapes, from desert sands and sparse woodland to open savannahs and granite outcrops, the park is one of Africa's finest wildlife refuges and we will have an opportunity to discover something of its natural treasures. Today we transfer to Victoria Falls where we spend the final nights of our tour. The thundering cascades of Victoria Falls, one of the planet's most spectacular natural wonders is called Mosi-oa-Tunya by the indigenous peoples (The Smoke that Thunders). The falls of the Zambezi River plummet over a sheer cliff wall that spans more than 1676m, dropping some 100m into the abyss below. This afternoon we take a tour of Victoria Falls, located on the southern bank of the mighty Zambezi, seeing for ourselves one of the most breathtaking sights on earth. Whilst neither the highest nor the widest set of falls in the world, it is the largest, and at its peak an astonishing 550,000 cubic metres of water cascade into the Zambezi Gorge every minute. Today is left free for you to follow your own interests. You may choose to take advantage of some of the many optional activities on offer such as whitewater rafting on the Zambezi or a scenic helicopter flight. You could also take an optional half day game drive into Mosi-oa-Tunya National Park to search for white rhino. Your leader will be on hand to advise you and to assist with any bookings. The tour ends today after breakfast. Depending on the schedule of your flights, you may be able to spend some additional time at leisure in Victoria Falls. Zimbabwe has a moderate climate, in the summer months (November to April) you can expect highs of 30 C° and lows of 20 C°. The wet season is from November to May when the days are typically dry and sunny with afternoon/evening thunderstorms. The best time for game viewing is September to October when days are dry and the temperatures are still relatively cool. Cape Town - Table Mountain Cable Car ZAR293pp return or ZAR151pp one way. Swakopmund - Living desert tour N$ 750; Museum N$ 30pp; Aquarium N$ 45pp; Township tour N$ 500pp; Half day dolphin cruise in Walvis Bay N$ 750pp. Etosha NP - Night game drive N$ 730pp. Victoria Falls - Whitewater rafting 6.5 hours US$ 130pp, (low or high waters are seasonal); Upper Zambezi canoeing 7 hours US$ 160pp; Zambezi river cruises sunset US$ 55pp, sunset & dinner US$ 85pp; Helicopter for 25 mins flight US$ 290pp (+ US$10pp park fees, minimum 3 persons); Game drives US$ 100pp for 4 hours; Cultural village tour US$ 61pp (including transfers). Clothing should be lightweight, however a warm fleece and jumper/thick shirts are essential, as nights (and daytime) can be cold, especially from May to September, and game drives tend to take place at dawn and dusk. A waterproof and windproof jacket is recommended during these months. Please note that brightly coloured clothing is not suitable for game viewing. Laundry can be done at Cape Town, Swakopmund and Victoria Falls. Don't forget your swimming costume! One main piece of baggage (a kitbag or soft holdall) plus daypack. Accommodated departures - We advise you bring a water bottle, sunhat, sunglasses and high factor sunscreen. Binoculars are essential for game viewing and a 300mm lens is recommended for photography. recommended for photography. Tents have sewn-in mosquito screening so nets are not required. Bring a battery recharger for your digital batteries on the truck, or alternatively a supply of batteries for the duration of the tour. Accordingly, you should allow US$60.00 per person for group tipping. Please Note: Allow US$ 30 for airport departure tax, payable when leaving Victoria Falls. Security Charge - With effect from 1 January 2011 the National Airports Corporation has added a Security Charge to all departing passengers payable at all NACL airports in Zambia. Cost is US $5 per person for international flights. Fees can be paid in US Dollars or Kwacha equivalent or any other major currency. Use US dollars only. The Zimbabwean dollar is no longer used. There is no need to change from US dollars, as you can used these locally. Please note that currently cash cannot be withdrawn with international bank cards. Not widely accepted, please do not rely on credit or debit cards. Travellers cheques are not being accepted by banks in Zimbabwe. South Africa, Namibia and Botswana have a good tourism infrastructure and generally good service levels. Our campsites are well set-up and maintained, often with dining areas, BBQ pits, small shop and bar, good toilet (shared) and shower blocks (shared). Like many adventures of this type, much of the team spirit and camaraderie is developed through mucking in and helping out with basic camp responsibilities which will include the setting up and taking down of camp and the loading and unloading of equipment. Camping is in two person tents , with your tour leader and driver preparing our meals. One great feature of camping is that it really gives us a sense of being in the African bush as we camp under the starry skies. Many campsites have unforgettable views. Of paricular note in Namibia is our first camp in Etosha, located close to the southern entrance of the park and famous for its flood-lit waterhole, where visitors can observe wildlife at close quarters. In Botswana camping is simpler but our campsites give a perfect experience; simple enough to give the feeling of really camping out in the African bush, yet with the comforts of 'proper' toilets and bucket showers. Depending on availability we may also have campsites with ablution blocks. Dietary requirements: Most restaurants and hotels in Zimbabwe do not have a wide selection of vegan and vegetarian choices. There is usually a choice of salads and one main vegetarian and/or vegan main dish on the menus, but choice will be limited especially in more remote locations. If you have specific dietary requirements we do recommend for you to bring some food with you. New Zealand passport holders do require a visa, please consult your local consulate for full information. Other nationalities should consult their local embassy or consular office for visa and/or transit visa information. All visitors should ensure their passport is machine readable and has two blank pages when entering and leaving South Africa. The South African Immigration officials will not allow child/ infant pages to be used for this purpose and visitors without the stipulated blank pages will be denied entry. Zimbabwe: Visas are required by UK, Republic of Ireland, Canadian, US, Australian and New Zealand citizens. These can be arranged on arrival for the current cost of US$55 (GBP 43/Euros49) for British and Irish passport holders, US$75 for Canadian passport holders, and US$30 for American, Australian and New Zealand passport holders for a single entry visa. If you are arranging your visa on arrival, please bring small new US Dollar notes only (not older than 2006) with you as immigration officers may not be able to provide change. All passports must have at least 6 months validity remaining on entry and also have three blank pages. Please note that all travellers aged over 9 months old that have travelled from or have transited via a country with a risk of yellow fever transmission, will need to present a Yellow Fever certificate at immigration/borders in Zimbabwe for inspection. We recommend protection against hepatitis A, tetanus and typhoid. Consult your travel clinic for latest advice on different prophylaxis available against malaria. Please check the latest requirements with your travel clinic or doctor prior to departure. The above is not an exhaustive list. Further information regarding vaccinations and travel health advice can be found by following the NHS and NaTHNaC links at Explore Travel Health and from your local healthcare provider. Visa and vaccination requirements are subject to change and should be confirmed by you before travelling. 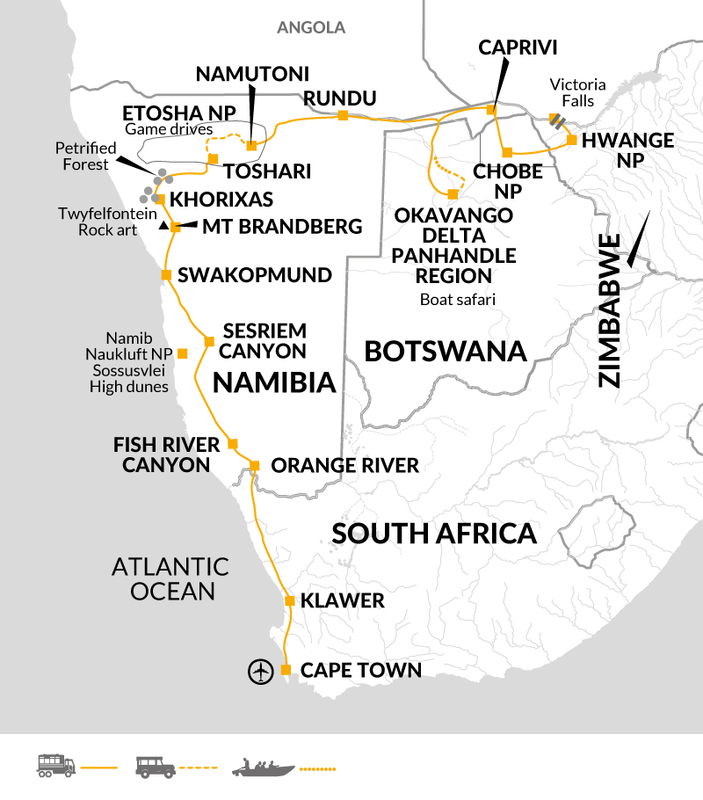 This iconic journey is perfect for adventurous travellers who want to experience the best of what Southern Africa has on offer. What makes this tour so special is the ever changing landscape, from the green of the Western Cape, up through the bright orange of the Namib Desert to the blue of the Okavango panhandle. This tour is an assault on the senses and really is a once in a lifetime experience.